Radiologic technologists support radiologists and are essential members of the healthcare team. In addition to being an integral part of any radiology specialty, they also receive the most compensation for their efforts. Most radiologic technologists go into the field with an Associates degree and make a median annual salary of $60,320. That’s two years less schooling for the same paycheck as some healthcare practitioners with bachelor’s degrees. 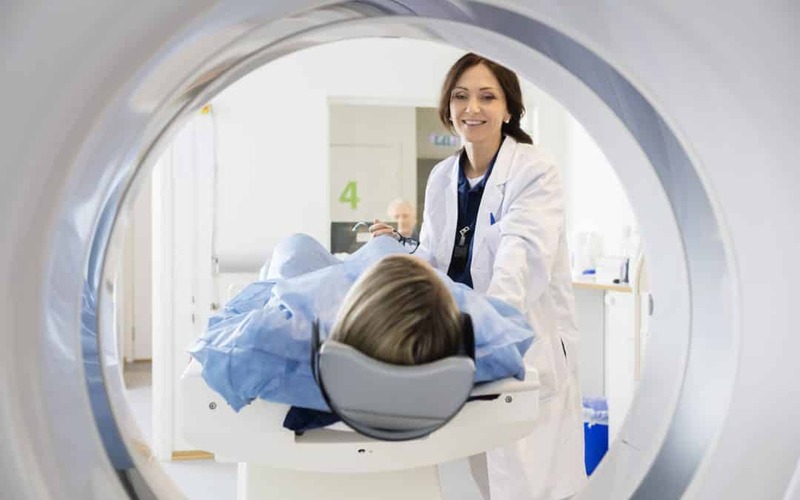 If you are detail-oriented, compassionate, and interested in a job that combines technology and patient-centered care, then a career as a radiologic technologist might be for you. Here’s how to become a radiologic technologist in just six steps. Formal education is the first step on your path to a career as a radiologic technologist. Most people in the position opt for the associate’s degree route. An AS or AAS provides a comprehensive education in the field but also allows you to get out into the field faster. You can also find certificate programs and bachelor’s degree programs. However, they tend to be underutilized. Keep in mind that the certificate program allows you to complete a lower-ranked program, but certificates take as long as an associate’s degree to complete (24 months). To begin with, you’ll need a high school diploma or GED. Most schools require the completion of certain prerequisites prior to application into the radiology program. Regardless, your school won’t ask for any other experience, which makes it perfect for entry-level students. During your degree, you may have the option to complete a radiologic specialization. However, it is not required. The classroom portion of the class usually wraps up after two years or four semesters. Your clinical requirements may take longer, but the length of the program varies by schools. Your accredited course in radiologic technology will include clinical experience hours. The structure of those hours depends on your program, school, and whether you complete the program on a full- or part-time schedule. You may find your school builds clinical experience credits into each semester beginning in your first year. Other schools wait to start experience credits until year two. Some build them into a summer session. Know that you’ll need to complete all your clinical hours and clinical competencies before graduating from the program. Once you complete your coursework and clinical hours according to your school’s standards, you can graduate and embark on the next steps of your journey. Graduating with an AS or AAS in Radiologic Technology is the first step towards entering the field. But the nature of the job means there’s more work to do. Ideally, the college or university near you provides a radiologic technology program accredited by the Joint Commission on Education for Radiologic Technology. If you complete a JCERT accredited program, you can then become eligible to sit for the ARRT Examination for certification in Radiologic Technology. Your course and practice skills will have taught you everything you need to know to pass the exam. However, you’ll still need to dedicate plenty of time to studying for the exam. Most states (over 75 percent) created licensing laws for radiologic technology. You’ll need a state license before you may practice in any healthcare facility. Some states use the ARRT exam as a licensure requirement, but the ARRT credential doesn’t mean you become automatically eligible to work there. However, states also write their own requirements for radiologic technologists. You may find that you need to take other exams to meet your state licensure requirements. Click here for a state-by-state guide for radiologic technology licensure. After completing school, passing exams, and getting licensed, finding a job is the easy part. Check out of the jobs boards on industry sites like the American Society of Radiologic Technologists. When identifying jobs, don’t assume your licensure makes you an automatic fit. Read the job description carefully to learn precisely what the healthcare provider expects from you. Being a radiologic technologist means keeping up-to-date with both licensure requirements and the latest science. ARRT requires you to keep up with your education with 24 units of continuing education every biennium. A biennium starts on the first day of the month of your birthday and ends on the same day two years later. If your state requires maintaining your ARRT certification to keep your license, then you’ll need to adhere to these standards. We wrote a full guide to completing biennium education requirements. Click here to learn more. Are You Ready for Your Career as a Radiologic Technologist? Are you ready for a career that allows you to help people find health and pays your bills? Becoming a radiologic technologist isn’t easy, but for the right person, it is a fulfilling career. Getting ready to take your national or state certification exam but feeling unprepared? We can help you pass the first time. Contact us to learn more about our test prep and continuing education options.